Composition book contains 100 sheets of special ruled, white paper. 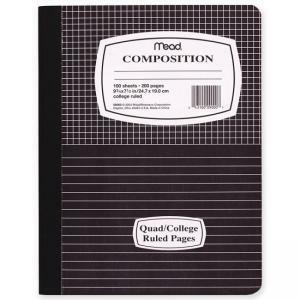 Each sheet has 5 x 5 quad-ruled paper on the top half and ruled lines on the bottom half. The inside cover has a preprinted area to fill in a class schedule. Inside back cover features a multiplication table, conversion table and grammar rules. Composition book has square corners along the glued binding and rounded corners on the other edge.